A long day of paddling can take its toll on your energy level, so you need to keep it up by eating. Granola bars, trail mix, and jerky are some of the quick and easy fuels you can use to keep yourself going through the day. I love to have a bag of jerky handy when I am paddling because I prefer not to stop for long periods of time opening up a pack to get out gear to make lunch. For me, jerky is a quick and easy grab food that I can eat while paddling or portaging. A couple pieces of jerky and a few swigs of water work for me. Since I bought a dehydrator many years ago, I prefer to make my own beef jerky as opposed to getting the store bought stuff, and I have a few favourite recipes that I use. While checking out some of my recipes, and sipping on some bourbon, an idea came to me; why not add bourbon to my jerky for a bit of a different taste. Well, one thing led to another and before I knew it, I had the outline for Bourbon Honey Maple Beef Jerky written out on a piece of paper. Now everything sounds good on paper, but would it taste as good as I hoped? There was only one way to find out! A trip to the store, some prep work, an overnight marinade, and a day of dehydration and my yummy paper idea was now a bag of jerky on my counter. So, before I lay out my recipe for you to try on your own, I will throw this out to you. When the jerky was on the tray, the first experimental piece was soooooo good. 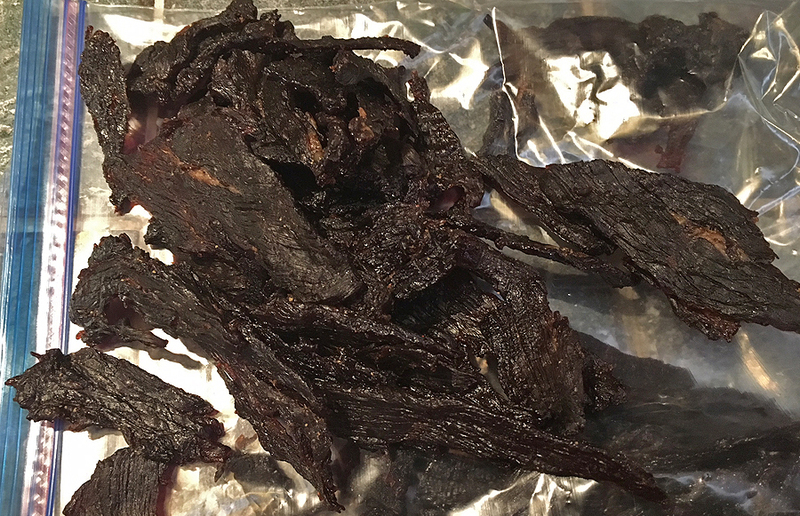 It was sweet with a bit of a pepper finish, but here is the part I hadn’t figured into the experiment; after sitting in the bag for a while, the jerky began to candy (for lack of a better term). It got harder on the outside. The only thing I could think was the honey was doing this. However, this did not affect the taste at all. It is just a bit tougher when you start chewing it, and there is so much flavour once you start eating it. My criticism: Not bourbony enough and maybe too much honey. As with any new recipe, there will be more experimentation needed. Changes I think I will make in the next batch will be 1 cup of bourbon (up from ¾), ½ cup of honey (down from ¾), and maybe a bit more pepper to add to the finish. So, here is the recipe as I made it, without any tweaks to it as mentioned above. If you want to try it with more bourbon and less honey, let me know how it turns out. Remove as much fat as possible and cut roast into 1/8” thick slices. Put all other ingredients in a bowl and whisk together until thoroughly mixed. Place beef slices into a large Ziploc bag. Pour liquid mixture into bag. Close bag, removing as much air as possible. Massage bag to make sure the liquid totally coats the beef. Put bag in the fridge to marinate for at least 12 hours, massaging the bag occasionally to mix everything around. After 12 hours (or longer) lay the strips of beef on your dehydrator trays, making sure not to overlap pieces. Dry according to your dehydrator instructions (mine tends to take 10 – 12 hours depending on the recipe).